Industrial Districts (IDs) are complex productive systems based on an evolutionary network of heterogeneous, functionally integrated and complementary firms, which are within the same market and geographical space. Setting up a prototype, able to reproduce an idealised ID, we model cognitive processes underlying the behaviour of ID firms. ID firms are bounded rationality agents, able to process information coming from technology and market environment and from their relational contexts. They are able to evaluate such information and to transform it into courses of action, routinising their choices, monitoring the environment, categorising, typifying and comparing information. But they have bounded cognitive resources: attention, time and memory. We test two different settings: the first one shows ID firms behaving according to a self-centred attitude, while the second one shows ID firms behaving according to a social centred attitude. We study how such a strong difference at micro-level can affect at macro-level the technological adaptation of IDs. After several decades of case-studies and comparative analyses based on empirical methods, one of the most important evidence that comes out about IDs is that they are systems too much complex to be understood according to standard neo-classical economic approach, theories, and models (Becattini 1990; Bellandi 2002; Dei Ottati 1994). That is basically the reason why the field of IDs studies has been, historically, a melting pot of scientists with different disciplinary backgrounds, such as economists, sociologists, historians, regional scientists, organisational scientists, and so on (for example, see: Cooke and Morgan 1998; Porter 1998; Whitford 2001), and a space of test for trans-disciplinary approaches, concepts and "stories"-based models (Morgan 2001). Another important point emerging from the ID empirical research ground is the need of approaches, theories and analytic tools that must be able to cope with the complexity, heterogeneity, variety, and qualitative change that characterise ID phenomena (Lane 2002; Rullani 2002). IDs could be understood as a testing bench for applied evolutionary economics, complex systems theory and their research tools, such as history-friendly models, narrative descriptions, empirical models, and agent-based models (Saviotti 1996; 2003, Dosi 2000; Dopfer 2001; Cantner and Hanusch 2001). Our paper attempts to suggest an example of how to use agent-based models in the field of IDs, and it explores some questions that recently arose in the empirical literature, following an evolutionary approach. In this perspective, one of the most intriguing question that crosses literature on IDs is the problem of how the heterogeneity of micro level and the diversity of behavioural attitudes of firms come dynamically to produce adaptation and evolutionary paths of the system as a whole, without the presence of "super-agents", collective decision makers, or forms of hierarchical management and coordination. Traditionally, the answer to such a question has been the idea of "community-based" IDs, where shared values and democratic-oriented inter-firm relations have been supposed to allow the system benefiting from spontaneously cooperation-oriented and homogeneous behaviour at micro level (Becattini 1990; Dei Ottati 1994). The result of such assumption has been the denial of the heterogeneity and autonomy of the micro-level and the transformation of the behaviour of ID firms into an analytical black box that has been thought of no relevance (Staber 2001). That is the reason why, despite some remarkable exceptions (see; Belussi and Gottardi 2000; Belussi and Pilotti 2002; Boari and Lipparini 1999; Borrai, Minoja and Sinatra 1998; Lombardi 2003; Sammarra and Biggiero 2001), the availability of empirical evidence indicating the weakness of explanations based on culture homogeneity, the fundamental presence of information asymmetries and hierarchical relations amongst ID firms, and the morphological heterogeneity of IDs (i.e., see Albino, Garavelli and Schiuma 1999; Belussi 1999; Biggiero 1999; Lazerson and Lorenzoni 1999, Paniccia 1998; Rabellotti 1995; Staber 2001), little attention has been paid to cognitive processes underlying ID firms and the role of firms micro-level in explaining important issues, as innovation and evolutionary adaptation of IDs as a whole. With a different approach, our paper attempts to focus on the micro level of ID firms, in order to firstly investigate some issues that are related to the problem of heterogeneity of behavioural attitudes of ID firms, and then to put together cognitive and evolutionary concepts for understanding IDs. It is worth to clarify that our model does not describe an empirical case of ID (for example, see Fioretti 2001), but rather an "ideal-typical" ID (for examples, see: Squazzoni and Boero 2002; Albino, Carbonara, Giannoccaro 2003). Such choice requires some introductory notes on different and possible ways of using agent-based models to understand economic and social phenomena. We argue that there are three types of agent-based models. These types should be viewed as radically different each other, because they conform to different ways of relating theory and empirical reality, and they seek for quite different goals. The first type is the "empirically based model", where goals are to model an empirical phenomenon, trying to reproduce as close as possible reality. It refers to the attempt of telling highly descriptive stories about reality. The logic of the model is the reproduction of a specific reality, through a descriptive scale that needs to conform to phenomenon dimensions. The second one is the "abstract model", such as, for instance, a game theoretical one, where goals are the understanding of theoretical mechanisms that commonly work in a wide range of different phenomena or classes of phenomena. The model does not attempt to have a strong reference to reality. In the midst of the foregoing types, we can identify a third class of models. They should be called "prototypic (or idealtypic) models". They are models about "ideal-typical" processes that work in a well-defined family or class of phenomena, such as industrial districts in our case. The aim is to reproduce stylised facts that form each other the architecture of an ideal-type, able to identify a general class of empirical phenomena. In this case, models should be used when a specific family of phenomena has already been deeply investigated, that is to say when a strong body of empirical studies, upon which the model can be built, are available. The final goal is to formalise and deeply investigate some issues arisen in the field. Concerning the contents of the paper, we argue that an effective link between evolutionary economics and complex systems theory, which agent-based models lay upon, has been already achieved. Thus, although evolutionary economics and complex systems theory speak a similar language (Dosi 2000; Lane 2002), we argue that the understanding of complex socio-economic phenomena, such as IDs, involves more contributions from cognitive sciences and sociology, too. This obviously implies more complicate agent-based models than usual. Usually, the standard in agent-based models is to assume simplicity at the micro level for studying macro emergent phenomena (Epstein 1999; Epstein and Axtell 1996). Emergences are produced by interactions of "simple" agents (the famous KISS principle), while the model complexity is not in agents but just in the interaction structure. The usage of simple agents, with simple rules of behaviour and without strong cognitive foundations, does not sound like social agents are in reality (Conte et al. 2001). The introduction in agents of more effective cognitive and social aspects should be a way to cope, right from the start, with the complexity of socio-economic phenomena, even at an agent level (Gilbert 1996). For instance, cognitive sciences and sociology tell us that institutions work mostly by reducing complexities that are radically embedded in the micro level (Conte and Castelfranchi 1995; 1996). Choosing to concentrate just on the bottom-up complexity that emerges by dynamics of aggregation among simple agents, means to loose an important part of the mechanisms through which socio-economic phenomena work (Conte 1999). Coping with the complexity in IDs, we have tried to adopt a complexity-based evolutionary modelling framework, able to explore the links among cognitive functions, heterogeneity and adaptation at micro level, dynamics of social contexts at meso level, and non-linear aggregation and evolution at the macro level of IDs as a whole (see also Boero, Castellani, Squazzoni 2002). Our opinion is that IDs must be conceived as complex systems founded on micro cognitive social agents. ID firms should be, therefore, social reflexive agents able of typifying, monitoring and internalising, in a cognitive sense, the characteristics of their social context of experience together with references to their individual actions. Shortly, firms should have a dialectic, problematic and open relation with their contexts of action and cognitive embeddedness. We suggest ABMs are a useful tool for investigating those aspects of socio-economic phenomena. are different social and behavioural attitudes of ID firms relevant to explain different outcomes at the macro level of ID (i.e. different qualitative capabilities of the whole system to learn over time)? are different social attitudes influencing the usage of bounded cognitive resources, as attention, making the management of information more useful and effective? To investigate the hypotheses just mentioned, we have put together different pieces of knowledge, from traditional studies on IDs (division of labour amongst firms, distributed coordination mechanisms, specialization and complementarity of firms, informal flow of information, proximity relations, and so on – see Becattini 1990), and neo-Simonian cognitive sciences (bounded rationality of agents, selective attention, time and memory as scarce resources, information processing activities as part of the decision, and so on – see March 1994; for a mathematical translation, see Selten 1998), to sociology (theory of typification, reflexivity, and contextualisation of action through day-to-day experiences – see Giddens 1986) and evolutionary economics (routinisation of action, focus on dynamics of innovation, adaptation and learning, market as an selective institutional mechanism, and so on – see Dosi 2000). the final section sketches out some conclusions on the questions we have suggested in the first section. By ID prototype, we mean the translation of an idealised and stylised ID into an agent-based architecture. Besides the empirical heterogeneity, IDs can be basically conceived as evolutionary networks of heterogeneous, functionally integrated and complementary firms, that are positioned into the same segmentation market and that are located into the same geographical area. ID firms produce goods on market according to a division of labour based on technology production fragmentation, phase complementarity and specific mechanisms of inter-firm coordination and integration. The fundamental organisational mechanism of IDs is the functional aggregation of complementary and specialised firms into production chains. ID firms can count on different kinds of proximity relations, or different spatial and organisational proximity metrics, which are relevant sources of information, mutual monitoring, learning, and knowledge diffusion. Basically, ID firms move within the same technology and market environment. In the ID prototype, we assume that firms are agents. ID firms are 400, divided in two classes and the second one is further divided in three segments, according to the assumption that the ID production process can be segmented in four parts. Consequently the division of labour is given and it is as follows: final firms, with functions of production organisation, assembling the final product, marketing and selling goods on market; sub contracted firms segment A, segment B, and segment C, with specific production functions. As it has been described in several case studies, the ID division of labour hides structural asymmetries of information, because just final firms have the vision of the production process as a whole and the detailed knowledge of collective outcomes and market (i.e., see: Lazerson and Lipparini 1999). But ID firms are interdependent, in the sense that they need to interact and coordinate each other for producing. The formation of production chains is the locus of such interdependence. We assume that a production chain needs to be composed by: 1 final firm + 1 sub firm A + 1 sub firm B + 1 sub firm C. The ID final good that goes on market is the result of such aggregation. Firms have two basic features: the techno-organisational asset (input) and the economic performance (output). They move in a specific technological landscape and market environment, in which they need to adapt. They undergo 2,000 simulation/production cycles, over which they face three phases of technological continuity, and two phases of technological discontinuity. In short, market causes two technological breakouts, around cycle 500 and 1,000, and ID firms need to adapt in order to improve economic performance (for details, see Squazzoni and Boero 2002). We assume that the succession of technological paradigms (T1, T2, T3) implies that ID firms need to learn the way of adapting their techno-organisational asset over time, investing not just in discovering, understanding and implementing a new technological paradigm, but also into adapting it to the internal organisational factors and vice versa. Technological paradigms, in fact, come jointly with a combination of numbers (i.e. T1: 0, 3, 7, 2), which represents, in a metaphorical way, a combination of capital, labour, materials, and different architectures supporting information and communication. Firms start the simulation from T1 (-1, -1, -1, -1), which means a state of no adaptation inside the first technological paradigm. For each paradigm, there is an unknown best practice level, randomly fixed, so that firms have to improve their production efficiency both by decreasing and increasing the numbers representing their production characteristics. We assume that firms deal with a continuous trial-and-error experimental learning that is characterised by path dependence. Firms explore new technological solutions starting from the technological position (production characteristics combination) in which they recently were. According to the distance/nearness relation between the best combination and their specific production combination, firms have costs and performance level as outcome of the production process (for details see table 2). For adapting and acquiring the best technological position, firms have two strategies: radical innovation (trying to guess a new number or combination of numbers, i.e. trying to modify the amount of factors used) and imitation by exploitation (imitating a different combination of numbers/factors of neighbouring firms). In fact, ID firms are located within a space populated by other firms, with spatial neighbourhood positions, along which pieces of information circulate and mutual monitoring is active, even if in an imperfect form (for details, see Boero, Castellani, Squazzoni 2002). To regulate all these computational operations, we introduce three tables, called Info Matrix, Tech Matrix, and Change Matrix in which all computational actions are transformed into cost and values (see table 1, 2, and 3 and for details see Boero, Castellani, Squazzoni 2002). We assume that the profit of firms overlaps with the profit of production chains. Firms have their individual level of profit, as it is shown in columns A and B of Tech Matrix. But, because of production segmentation and interdependence of firms, we assume that profit emerging by production chains is not the simple sum of the individual profit of interacting firms. An "extra profit" mirrors the degree of technological compatibility amongst interacting firms, that is to say the capabilities of firms to quickly produce goods and to produce them with a higher level of quality. This is what we call in the simulation code the "time compression" value, which measures the presence of a technological standard amongst interacting firms. This value awards more the presence of these standards in higher technological paradigms. Such value generates the "extra profit", an added value generated just by the assemblage of the product, that can be distributed by final firms to their sub contracted firms, according to the behavioural attitudes described below. Table 1: "Change Matrix" shows costs needed to implement a new technology, that is to shift to a more complex technological paradigm, (first line) or to improve the techno-organisational asset, that is to say to change number/factors combination (second line). Along the column, there are all the three paradigms impacting ID firms over time. Costs gradually increase over time. Table 2: "Info Matrix" shows costs that firms must pay in order to achieve different type of information. Information concerns both technological strategies (innovation and imitation), and partnership selection mechanisms. The second case refers to different information criteria by which final firms organise their production chains, aggregating a team of sub contracted firms. Final firms continuously need information about economic, technological and organisational features of sub contracted firms in order to choose between stabilising or destabilising their inter-organisational contexts (production chains). Table 3: "Tech Matrix" shows data about costs and performance of firms in all the different learning steps undertaken by firms. As it is mentioned above, technology costs and economic performance gradually increase as well as market requests over time. Column A shows technology costs, B shows levels of achievable performance, and C shows decreasing costs for the usage of the same combination of number/factors for more than one simulation/production cycle. All costs and performance values are expressed by a continuum between the "worst" and the "best" techno-organisational levels, with an average on the degree of distance/nearness of the combination of number/factors implemented by firms with respect to the range just mentioned. As stated above, we assume that the goal of ID firms is of trying to continuously improve their performance in order to keep on selling. They have a level of resources to invest for adapting their techno-organisational asset to face market challenges. Obviously, resources are the result of their past decisions. Market asks for a continuous quality improvement of ID goods and selects firms on that basis. To improve their performance, firms continuously undertake information processing activities concerning market and technology, partnership context, organisational and economic internal features. This is what we call the information-action loop. It is the core of the cognitive architecture of ID firms. The information-action loop should be seen as a kind of "cognition cycle" with procedural-based learning characteristics. We assume that ID firms are bounded rationality agents, with finite computational capabilities, in terms of time, selective attention, and memory horizons (see: Simon 1987; 2000; March 1994). We assume that they have bounded capabilities of monitoring all their fields of decision and action, in cognitive sense, but they try to do that, through processes of cognitive typification, generalization and abstraction of information data. We assume a trade-off between width and depth of information-processing activities, so that while firms categorise, typify, clusterise and generalise information, they loose specificity, details and precision of information (see figure 2). 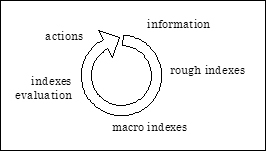 The information-action loop works as follows: firms relate data to appropriate rules of decision, just by means of an evaluation of information built upon the construction of cognitive macro-indexes which allow them to monitor their universe of perception and to develop an attribution of sense upon it (see figure 1). These activities are part of their day-to-day experience embodied in cognitive routines. Firms process information to elaborate positive or negative judgments that drive their decision on what to do. Cognitive steps are as follows: transformation of information in rough indexes through clustering of similar information, synthesis of rough indexes in macro indexes through higher-level abstraction, selective attention on indexes, indexes evaluation driven by specific behavioural attitudes, decision and routines of action (see below). Moreover, information concerns topics such as market, partnership, and organisational effectiveness, comparisons with other firms, and so on, with data encoding both spatial and temporal dimensions. There are 30 sources of information, they are evaluated and clustered into 17 rough indexes, and then they are translated into 5 macro indexes that allow firms to take decisions. ID firms have access to different kinds of information, about their activities, the activities of other firms belonging to the ID, and the ID as a whole economic unit. They are able to typify information, to perceive similarities and analogies that are hidden in it, and to shape a perceptive vision about it. In the first step, they are able to cluster information belonging to the same area of interest, and to draw up a first. This is what we call rough indexing. Rough, obviously, because indexing process needs to be further developed and abstracted, too. Information indexing is a metaphor of the cognitive process of information abstraction, selective attention, and framing formation that is typical of social agents (Ocasio 1997; Walsh 1995). Such a vision sticks together elements of mapping activity (Spellman and Holyoak 1996) and sense-making, a construct tightly related to the capacity of firms to set up in a frame the relationship between information processing and other crucial practices (Thomas, Clark and Gioia, 1993). investment on techno-organisational asset over time (comparison among average values of investment on techno-organisational assets of firms and neighbourhood over time, namely using data of last 20 simulation cycles). Broadly speaking, the activity of rough indexing should be seen as the cognitive basis through which firms shape a contextualised vision of themselves. There is general information, such as that related to the ID as a whole (i.e., 4, 5, 6, and 7), upon which firms frame their general context of reference; there is specific information, such as the one related to fundamentals of firms, upon which firms frame the specific context of their internal actions, and also the comparative one (i.e., 1, 2, 3, 8, 9 and so on) upon which firms frame their relational context in a spatial sense (comparison between the self and the neighbourhood). Through such indexes, firms are able to infer a positive or negative judgment upon information. For instance, questions as follows: Do my features fit with market? Am I in a good context of relation? Are firms which I am involved with, in time with market? and so on. To recall the words of Giddens (1986), this is a fundamental part of the "day-to-day" cognitive actions and experiences of firms over time, as though they were a cognitive structuring architecture that frames their experience over time. economic, that is a macro inference allowing a judgment on positive or negative features of economic fundamentals (do I have any economic problem?). Figure 2. From information to indexes, by means of an "approximation-abstraction-synthesis mechanism". 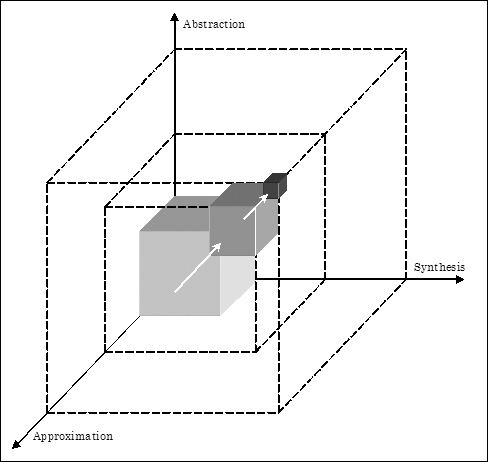 In order to transform information data (the lightest solid), into rough indexes (the middle one) and then into macro indexes (the darkest solid), agent-based cognitive operations face a trade-off between the increase in the degree of the three dimensions (abstraction, synthesis, approximation) and the decrease of the volume of information to be considered. where Ma , Wa1 , Ra1 , etc.. ∈ [0,1] and Ma represents a macro index, Wa1 is the weight of the first rough index Ra1, and so on. ID firms are heterogeneous and hence they have different values for weighting rough indexes in the macro ones. In this way, ID firms are able to evaluate their situation and to perceive the presence of problems in their cognitive representation of themselves and their relation with the environment. But to do this, they can count on finite cognitive resources, such as time and selective attention. We assume that selective attention and time are closely related to the probability of indexes updating. In fact, considering these boundaries, we assumed that firms can update just one index each time step. We assume that each macro index has a probability to be updated, and that, at the start of the simulation, such a probability is 20% for all the indexes (5). Over time, the modification of the value of this probability is related to the level of indexes, and it works as follows: if a value of one or more indexes is less than 0.5, then they call for attention and if the values of other indexes are greater than 0.5, then the attention shifts to the formers; otherwise, if indexes do not reach such values, or if the values of all indexes are less than 0.5, then the attention stays on the same distribution as before. In other words, the probability to update an index is a measure of the attention firm spends towards that source of information, and if the source of information communicates bad news, firm takes more and more care about that topic. Since a coherent course of action needs one or more mechanisms which drive attention on different sources, perhaps in hypothetical contrast each others, then we introduce a simple mechanism that represents the capability of firms to select a part of the information set and to retain it as a salient and significant item. Considering attention as a sort of sense-making activity, or in a more general way, as an "interest" (see Haley 1971; Ratneshwar, Warlop, Mick and Seeger 1997), lets firms make goal-relevant inferences (Holland, Holyoak, Nisbett, and Thagard 1986), as in the case of macro-indexes updating. In our perspective, selective attention is conceived as selection for acting, where for action we mean the whole process of decision making, according to the idea that cognition itself is an action. The complex cognitive architecture described above is the background that allows firms to take decisions in their operation fields. We assume that decision depends on behavioural attitudes, which are similar to looking glasses letting firms enable a connection among cognitive frame, attribution of sense to reality, and appropriateness of action. According to specific behavioural attitudes, firms have a finite set of action recipes, that are a sort of guidelines on which firms experience over time. Firms can count on a finite memory on what has happened in the past, and they have an imperfect capacity of closely typifying the relation between the successful application of an action recipe in the past and specific situation-motivation on why the choice of that specific recipe has been done. The process that drives firms from action recipes to decision within specific operation fields takes a ruotinisation-like form, that is to say firms in their day-to-day experience are pushed to economise cognitive procedures that go from information to decision, defining sound and stable guidelines. Broadly speaking, if things are going well, firms will not spend their time to deeply explore other types of connections between action recipes and courses of decision. We have created two different experimental settings to be simulated and compared: the first one shows ID firms behaving according to what we call a "self centred attitude", while the second one shows ID firms behaving according to what we call a "social centred attitude". To have a self centred attitude means that a firm is located in an ID context, has specific neighbouring firms, can count on several sources of information, enacts production relations with other firms, produces and sells products, tries to increase its economic performance, and to improve its techno-organisational asset, and so on, but that it is not interested in establishing stable and rich relations with other firms. That is to say, it looks for improving its performance trying to interact with optimal partners, even if this means to have continuously one-shot interactions. The imperative of a self centred ID firm is that of economic performance, and its looking glasses are that of the optimising behaviour that is close to the image of "homo oeconomicus" coming from the mainstream economic theory. Instead, to have a social centred attitude implies that firm is not simply located in an ID context, but that it is conscious of that fact, it is able to reflect upon it and to take care about the context. Firms here recognise their relational context as a stable and positive property of their individual experience, as a thing that needs to be actively reproduced. By exploring ID context, firms create with others a kind of "relational tie", where information is exchanged, learning takes mutual directions, and resources are less or more shared. According to these statements, as it is shown in table 4 and in figure 3, we assume the presence of four operation fields, called "technology", "keep", "search", and "share". They imply operational decisions that firms need to accomplish over each day-to-day production/simulation cycle. "Technology" refers to the needs of firms to exploit context-based local information to improve the performance of their techno-organisational assets. "Keep" and "search" refer to how firms manage their partnership relations, while "share" refers to the policy of chain profit management that firms conduct. To summarise, questions for firms are as follows: which kind of information should I select in order to improve my techno-organisational asset? Which kind of information should I select in order to define and/or stabilise my partnership relations? Which kind of policy of profit distribution should I follow within my production chain? All the firms, despite their different behavioural attitudes, are pushed to create routines of such courses of decision. We assume that different behavioural attitudes imply different action recipes, because they relate operation fields, i.e. spaces of possibilities, to different action recipes, i.e. selective options in spaces of possibilities. In short, at the start of the simulation, firms use a specific recipe randomly assigned. Over time, they carry on using it, by transforming the recipe into routine. The routine is broken when macro indexes push firms to change it. Therefore, firms begin a phase of trial and error processes trying to define a new routine within action recipes. Thus, routines can be maintained or changed, and this is a focal phase of firm action. The role of macro indexes and their configuration is fundamental for understanding why and how firms change or maintain their routines. Macro indexes configuration is conceived as the adaptation mechanism that forces agents towards learning about routines. We assumed a fixed number of indexes configurations and the presence of a sort of "ringing bell mechanism", which represents the capacity of firms to perceive the presence of an unsatisfactory routine. Specific configurations of macro-indexes cause the activation of the ringing bell mechanism, driving the attention of the agent on a specific topic. The ringing bell mechanism means that firm has some problems with its routines. It is based on the hypothesis that selective attention of firms is oriented towards fixed operation fields, and directed to specific significant areas of the problem space, by means of a sort of "distinctiveness", which is related to the notion of memory as a processing activity (Lockhart and Craik 1990). otherwise, if "technology index" is less than 0.25, firm starts to change its routine in the "technology" operation field; if "organisation index" is less than 0.25, firm starts to change its routine with equal probability in "keep" or "search" operation fields, while if "organisation index" is less than 0.25 or greater than or equals 0.5, firm starts to change its routine in "share" operation field; if "economic index" is less than 0.25, firm starts to change its routine in "technology" operation field and with equal probability its routine in "keep" or "share" operation field. The rationale of changing routines is that firms, while facing the perception of a problem within an operation field, can use their memory on past routines, that is to say the last five periods of time during which a routine has been used, to support their routine definition process. Firm can relate routines to macro-indexes in order to define positive or negative associated values. According to memory function, firm changes, evaluates and chooses routines. in the case of complete exploration of all possible routines, using data referring to the past, firm defines its new routine according to an evaluation about the relation between routines and macro-indexes. It is worth to notice that the link between memory and information processing has a procedural cognitive nature, focused on a frugal design by which cognitive limitations of firms imply a restricted possibility of items recalling. Firms explore, maintain and change routines of actions by means of a step-by-step adjustment mechanism by which they develop information according to specific "search rules" (Gigerenzer and Selten 2001) within specific behavioural attitudes. Shortly, as it is shown in table 5, behavioural attitudes imply search rules towards activities of operative problem solving. Search rules act within different repertoires of routines, which are composed by different action recipes, according to specific behavioural attitudes. In conclusion, the cognitive architecture of ID firms is based on cognitive typification activities that relate continuously individual experience and social contexts. This is what we call the property of social reflexivity of ID firms. For social reflexivity, we mean the capacity of ID firms of monitoring, typifying and internalising, in a cognitive sense, the characteristics of their social context of experience as a stable structure, a positive part, as well as a reference of their individual action. For typification, we mean the capacity of ID firms of monitoring and making a sense about what they have done and what they have to do, that is related to the capacity of developing cognitive inferences upon the structure of social contexts and technology and market environment which they move within. For routinisation, we mean that all such activities are embodied in "day-to-day" (cycle after cycle) cognitive experience and actions of ID firms. In a specific sense, action has here what Emirbayer and Mische call a "practical-evaluative dimension" associated with a "relational dimension" (Emirbayer and Mische 1998). Clearly, these cognitive processes imply high procedural-logical costs and are intrinsically bounded and imperfect. Time, attention, and memory are finite resources, and typification, monitoring, evaluation, and translation of information into action are complex processes. This is the reason why firms tend continuously to routinise cognitive processes, as though they can be transformed into low-cost algorithms. final firms at the top of techno-organisational level; this is a proxy of the dynamics of technological learning of ID as a whole. As shown in figure 4, economic adaptation of ID with self-centred and social-centred firms differs over time. In the first case (set 1), the first technological shock causes a quite strong market selection, after about 580 cycles. In fact, 13% of firms go quickly out of market, while in the second case (set 2), only 2% of firms have been cut off, because of the first technological discontinuity. Set 2 shows that 98% of firms stay on market till the end of the simulation, despite a crisis around 1,000 cycles, where 55% of firms have a stop and go for one production cycle. This is a crisis of adjustment over the second phase of discontinuity, that is the transition between technological paradigms T1 and T2. Observing the outcome in figure 4, it is possible to suggest that, introducing social centred firms, we have an ID characterised by a stable and sound technological adaptation path. The other proxies confirms this suggestion. As shown in figure 5, phases of technological discontinuity are marked by changing dynamics of indexes. Self-centred firms show high variability and high values of macro indexes, with the exception of "technology index", and a great emphasis on "environment" during the first technological discontinuity. Social centred firms show less variability of indexes with emphasis on "economic" and "technology" indexes, and less emphasis on "environment". Figure 6 shows the dynamics of cognitive distribution of attention. Self centred firms primarily focus their attention to technology index, while social centred firms to economic index. Moreover, while social centred firms quickly stabilise their distribution of attention according to a sound pattern of polarisation, self centred firms show a dynamic more unstable and sensible to changing market and technology environment and focused on economic and techno-organisational features. By comparing figure 5 and 6, it is possible to observe this different dynamic of cognitive processes of firms. As shown in figure 7, despite a great emphasis of cognitive resources on techno-organisational features, self centred firms show a technological adaptation path more troubled and less convincing with respect to social centred ones. Not only phases of technological discontinuity are better absorbed by the latters, but also the first phase of technological continuity (from cycle 0 to cycle 500) outlines a slow adaptation rate of self centred firms, while the top level of techno-organisational asset is quickly reached by social centred ones. Finally, it is worth to notice that, since structural properties of ID prototype have been kept invariant both for set 1 and set 2, such a different simulation outcome must be related to differences at micro-level of behavioural attitudes of firms. Different social and behavioural attitudes of ID firms seem to be relevant to explain different outcomes at macro level of ID as a whole, and above all, different qualitative capability of the system to learn over time. Summarising, social oriented attitudes influence the capability of firms to use finite cognitive resources, such as time, attention, and memory, making the management of information more effective for ID as a whole. Considering simulation outcomes, it is possible to outline that ID firms, more oriented to contextualise their actions in a social sense, have produced technological adaptation paths that show more effectiveness over time at macro level. Clearly, the paper figures out simply a first step in the analysis of cognitive and social processes of technological adaptation of IDs, given our prototypic framework. The next step should be the inclusion of institutional mechanisms able to reduce the complexity of micro-level. But, from the time being, the paper has shown that the understanding of the dynamics of adaptation in the context of IDs can be achieved without reducing the behavioural aspects of ID firms to an analytical black box, as it happens in standard economic and sociological models of IDs. From the theoretical point of view, it is possible to stress that concepts and tools from evolutionary economics, cognitive sciences, and sociology have proved to be integrable within the complexity science framework, and transferable into agent-based models. Moreover, the example we have shown should clarify a relevant advantage in using agent-based models in social sciences: the possibilities given by inter-disciplinary modelling (Conte, Hegselmann, Terna 1997). Finally, from a methodological point of view, it is possible to conclude that agent-based models are a flexible tool, for exploring issues both in the perspective of direct empirical models (specific phenomena) and of prototypic models (specific classes of phenomena). They can be used to strengthen, at different levels, the link between theory and reality. 1 The ID Prototype has been created using SWARM libraries and Java programming language. SWARM is a toolkit for developing agent-based simulations (see: http://www.swarm.org), and it is used by a growing community of social scientists (i.e., see Terna 1998). For descriptions and applications of SWARM to economic phenomena, see Luna and Stefansson (2000) and Luna and Perrone (2001). For obtaining the simulation code, please write to authors. 2 The identification between agents (“computational units”) and firms is a quite strong assumption, even if it is a standard practice both in the literature on agent-based models and in evolutionary economics. But, in the case of IDs, such a reduction seems less strong, since ID firms exhibit a close identification amongst entrepreneurship, ownership and management (i.e., see other simulation models: Brenner 2001; Fioretti 2001; i.e., see behavioural analysis in Moran 1998). ALBINO V, CARBONARA N and GIANNOCCARO I (2003) Coordination Mechanisms Based on Cooperation and Competition within Industrial Districts: An Agent-Based Computational Approach. Journal of Artificial Societies and Social Simulation, Vol. 6, No. 4. http://jasss.soc.surrey.ac.uk/6/4/3.html. BECATTINI G (1990) "The Marshallian Industrial District as a Socioeconomic Notion". In Pyke F, Becattini G and Sengenberger W (Eds. ), Industrial Districts and Inter-Firm Cooperation in Italy, Geneva: International Institute for Labour Studies. pp. 37-51. BELLANDI M (2002) Italian Industrial Districts: An Industrial Economics Interpretation. European Planning Studies, Volume 10, No. 4. pp. 425-437. BELUSSI F (1999) Path Dependency vs. Industrial Dynamics: An Analysis of Two Heterogeneous Districts. Human System Management, 18. pp. 161-174. BELUSSI F and GOTTARDI G (Eds.) (2000) Evolutionary Patterns of Local Industrial Systems: Towards a Cognitive Approach to Industrial Districts, Aldershot Brookfield Singapore Sidney: Ashgate. BELUSSI F and PILOTTI L (2002) Knowledge Creation, Learning and Innovation in Italian Industrial Districts. Geografiska Annaler, 84 B, 2. pp. 125-139. BIGGIERO L (1999) Markets, Hierarchies, Networks, Districts: A Cybernetic Approach. Human System Management, 18. pp. 71-86. BOARI C and LIPPARINI A (1999) Networks within Industrial Districts: Organising Knowledge Creation and Transfer by means of Moderate Hierarchy. Journal of Management and Governance, 3. pp. 339-360. BOERO R, CASTELLANI M, SQUAZZONI F (2002) "Cognitive Identity and Social Reflexivity of the Industrial District Firms. Going Beyond the 'Complexity Effect' with an Agent-Based Computational Prototype". In Lindemann G, Modt D, Paolucci M, Yu B (Eds. ), Proceedings of the International Workshop on Agent-Based Social Systems: Theories and Applications, Hamburg: Hamburg University. pp. 1-29. BORRAI M, MINOJA M and SINATRA A (1998) The Relationship between Cognitive Maps, Industry Complexity and Strategies Implementations: The Case of the Carpi Textile. Clothing Industrial System. Journal of Management and Governance, 2. pp. 233-266. BRENNER T (2001) Simulating the Evolution of Localized Industrial Clusters- An Identification of the Basis Mechanisms. Journal of Artificial Societies and Social Simulation, Vol. 4, No. 3. http://jasss.soc.surrey.ac.uk/4/3/4.html. CANTNER U and HANUSCH H (2001) "Heterogeneity and Evolutionary Change: Empirical Conception, Findings and Unresolved Issues". In Foster J and Metcalfe J S (Eds. ), Frontiers of Evolutionary Economics. Competition, Self-Organization and Innovation Policy, Chentelham, UK, Northampton, Massachussets, USA: Edward Elgar. pp. 228-269. CONTE R (1999) Social Intelligence among Autonomous Agents. Computational and Mathematical Organization Theory, 5, 3. pp. 203-228. CONTE R and CASTELFRANCHI C (1995) Cognitive and Social Action, London: University College London. CONTE R. and CASTELFRANCHI C. (1996) "Simulating Multi-Agent Interdependencies: A Two-Way Approach to the Micro-Macro Link". In Troitzsch K G, Mueller U, Gilbert N and Doran J (Eds), Social Science Microsimulation, Berlin: Springer-Verlag. pp. 394-415. CONTE R, EDMONDS B, SCOTT M, SAWYER R K (2001) Sociology and Social Theory in Agent-Based Social Simulation: A Symposium. Computational and Mathematical Organization Theory, 7. pp. 183-205. CONTE R, HEGSELMANN R, TERNA P (1997) "Social Simulation- A New Disciplinary Synthesis". In (Eds. ), Simulating Social Phenomena, Berlin: Springer-Verlag. pp. 1-17. COOKE P and MORGAN K (1998) The Associational Economy. Firms, Regions, and Innovation, New York: Oxford University Press. DEI OTTATI G (1994) Co-operation and Competition in the Industrial Districts as an Organisational Model. European Planning Studies, No.4. DOPFER K (2001) "History-Friendly Theories in Economics: Reconciling Universality and Context in Evolutionary Analysis". In Foster J and Metcalfe S J (Eds. ), Frontiers of Evolutionary Economics. Competition, Self-Organization and Innovation Policy, Chantelham, UK, Northampton, Massachussets, USA: Edward Elgar. pp. 160-187. DOSI G (2000) Innovation, Organisation and Economic Dynamics. Selected Essays, Cheltelham, UK, Northampton, Massachussets, USA: Edward Elgar. ESPTEIN J M (1999) Agent-Based Models and Generative Social Science. Complexity, 4, 5. pp. 41-60. EPSTEIN J M and AXTELL R (1996) Growing Artificial Societies. Social Science from the Bottom-Up, Cambridge, Massachusetts: The MIT Press. FIORETTI G (2001) Information Structure and Behaviour of a Textile Industrial District. Journal of Artificial Societies and Social Simulation, Vol. 4, No. 4. http://jasss.soc.surrey.ac.uk/4/4/1.html. GIDDENS A (1986) The Constitution of Society. Outline of a Theory of Structuration, Berkeley and Los Angeles: University of California Press. GIGERENZER G, SELTEN R (Eds.) (2001) Bounded Rationality. The Adaptive Toolbox, Cambridge, Massachusetts, USA: The MIT Press. GILBERT N (1996) "Holism, Individualism and Emergent Properties. An Approach from the Perspective of Simulation". In Hegselmann R, Mueller U and Troitzsch K G (Eds), Modelling and Simulation in the Social Sciences from the Philosophy of Sciences Point of View, Dordrecht/Boston/London: Kluwer Academic Publishers. pp. 1-27. HALEY R I (1971) Beyond Benefit Segmentation. Journal of Advertising Research, 11. pp. 3-8. HOLLAND J, HOLYOAK K J, NISBETT R, and THAGARD P (1986) Induction: Processes of Inference, Learning, and Discovery, Cambridge, Massachussets: MIT Press. LANE D (2002) "Complexity and Local Interactions: Towards a Theory of Industrial Districts". In Curzio Quadrio A and Fortis M (Eds. ), Complexity and Industrial Clusters, Berlin: Springer Verlag. LAZERSON M H and LORENZONI G (1999) The Firms that Feed Industrial Districts: A Return to the Italian Source. Industrial and Corporate Change, vol. 8, N. 2. LOCKHART R S and CRAIK F I M (1990) Levels of Processing: A Retrospective Commentary on a Framework for Memory Research. Canadian Journal of Psychology, 44, 1. pp. 87-112. LOMBARDI M (2003) The Evolution of Local Production Systems: The Emergence of the "Invisible Mind" and the Evolutionary Pressures Towards More Visible "Minds". Research Policy, Volume 32, No. 8. pp. 1443-1462. LUNA F, STEFANSSON B (Eds.) (2000) Economic Simulation in Swarm: Agent-Based Modelling and Object-Oriented Programming, Boston/Dordrecth/London: Kluwer Academic Publishers. LUNA F, PERRONE A (Eds.) (2001) Agent-Based Methods in Economic and Finance: Simulations in Swarm, Boston/Dordrecth/London: Kluwer Academic Publishers. MARCH J G (1994) A Primer on Decision Making, New York: The Free Press. MORAN P (1998) Personality Characteristics and Growth-Orientation of the Small Business Owner-Manager. International Small Business Journal, 16, 3. pp. 17-39. MORGAN M S (2001) Models, Stories and the Economic World. Journal of Economic Methodology, Volume 8, No. 3. pp. 361-384. OCASIO W (1997) Towards an Attention-Based View of the Firm. Strategic Management Journal, Vol. 18 (Summer). pp. 187-206. PANICCIA I (1998) One, Hundred, Thousand of Industrial Districts: Organisational Variety in Local Network of Small and Medium Enterprises. Organisation Studies, 19, 4. PORTER M E (1998) On Competition, Boston: Harvard Business Review Books. RABELLOTTI M (1995) Is there an "Industrial District Model"? Footwear Districts in Italy and Mexico Compared. World Development, 23, 1. pp. 29-41. RATNESHWAR S, WARLOP L, MICK D G and SEEGER G (1997) Benefit Salience and Consumers' Selective Attention to Product Features. International Journal of Research in Marketing, 14. pp. 245-249. RULLANI E (2002) "The Industrial District (ID) as a Cognitive System". In Curzio Quadrio A and Fortis M (Eds. ), Complexity and Industrial Districts, Berlin: Springer Verlag. SAMMARRA A and BIGGIERO L (2001) Identity and Identification in Industrial Districts. Journal of Management and Governance, 5. pp. 61-82. SAVIOTTI P P (1996) Technological Evolution, Variety and the Economy, Chentelham, UK, Northampton, Massachussets, USA: Edward Elgar. SAVIOTTI P P (2003) (Eds.) Applied Evolutionary Economics. New Empirical Methods and Simulation Techniques, Chentelham, UK, Northampton, Massachussets, USA: Edward Elgar. SELTEN R (1998) Aspiration Adaptation Theory. Journal of Mathematical Psychology, 42. pp. 191-214. SIMON H (1987) "Rationality in Psychology and Economics". In Hogart R M and Reder M W (Eds. ), Rational Choice, Chicago: Chicago University Press. SIMON H A (2000) Bounded Rationality in Social Science: Today and Tomorrow. Mind & Society, vol. 1. pp. 25-39. SPELLMAN B A and HOLYOAK K J (1996) Pragmatics in Analogical Mapping. Cognitive Psychology, 31. pp. 307–346. SQUAZZONI F and BOERO R (2002) Economic Performance, Inter-Firm Relations and Local Institutional Engineering in a Computational Prototype of Industrial Districts. Journal of Artificial Societies and Social Simulation, Vol. 5, No. 1. http://jasss.soc.surrey.ac.uk/5/1/1.html. STABER U (2001) The Structure of Networks in Industrial Districts. International Journal of Urban and Regional Research, Vol. 25, No. 3. pp. 537-552. THOMAS J B, CLARK S M and GIOIA D A (1993) Strategic Sensemaking and Organizational Performance: Linkages among Scanning, Interpretation, Action, and Outcomes. Academy of Management Journal, 36. pp. 239-270. TERNA P (1998) Simulation Tools for Social Scientists: Building Agent-Based Models with Swarm. Journal of Artificial Societies and Social Simulation, Vol. 1, No. 2. http://jasss.soc.surrey.ac.uk/1/2/4.html. WALSH J P (1995) Managerial and Organizational Cognition: Notes from a Trip-Down Memory Lane. Organization Science, 6. pp. 280-321. WHITFORD J (2001) The Decline of a Model? Challenge and Response in the Italian Industrial Districts. Economy and Society, Vol. 30, No. 1. pp. 38-65.